Did you ever stop to think about how much we rely on trust in business? It's so ingrained into our decision making that we take it for granted. You've heard it a thousand times: We do business with people we know, like, and trust. Take trust out of that equation and you really change the result. After all, we can get to know just about anybody - especially if they're likeable. There are four stages in a trust relationship: Meet, Vet, Establish, and Maintain. We meet lots of people. Those of us who attend marketing groups, tip exchange groups, chamber meetings, and service organizations might meet a hundred new people in a month. And maybe a thousand people we've met before. We obviously do business with very few of them. Once we think that we might do business with someone, a vetting process has to take place. Some vetting is automatic - even unconscious. If we don't like the way someone talks, looks, stands, or presents their business then they are out of the running without any real consideration. Once we decide to consider someone, a more formal vetting process begins. It might be simple or complex. It could be as simple as their working habits: Did they email a response within an hour of your request? Or it might be very formal with multiple interviews. In very small business, it is common that clients choose vendors without a formal selection process. In other words, there's no real competition. A company is considered and hired (or not hired). As a result, most of the vetting takes place in a single meeting. When the selection process is more formal, the vetting takes place across several meetings with different people. Once vetted, we have to establish the relationship. Vetting sets up the relationship. In the "establishment" stage we have proof that the decision was correct and that the partner is delivering goods and services as expected. You might consider this the final piece of the vetting process, but it really is separate. In the establishment stage, the client relaxes and feels good that the decision was correct. this is a critical element in the relationship. At this point the long-term relationship begins. The final stage is maintenance. As you move into the execution of your partnership, you have to do more than perform excellent work. You also need to pay attention to maintaining the relationship. You can do an excellent job - technically - and still lose the trust of the client. This is because the trust component has to do with the personal relationship and not the technical execution. Trust elevates your relationship from "outsider" to "insider" status. If you want to be part of the team - to be the outsourced CIO - then you need to establish and maintain trust. That means you need to constantly work on the personal side of the relationship. Note that trust, in this context, is not a moral evaluation. This is not an evaluation of whether you are "trustworthy" on the moral side. This trust has to do with Integrity: Do you follow through and perform as advertised? Integrity means to be whole and complete. When you act with integrity, all the parts work together. In this sense, a client can trust you because the whole package works together. If you say that you'll take care of something, you do. If you say you will remove their burden, you do. You lack integrity when the trusting piece doesn't fit with the action piece. Once a business owner picks a team of people to trust, he's locked in and needs to rely on his team for his success. The payoff of the vetting process is a team you can rely on. The danger is that you've chosen the wrong team. That's why all members of the team need to keep working on the trust component. The maintenance stage can last for decades . . . if you put effort into maintaining the relationship. Some business owners get stuck at the point where they need to rely on a team for their success. You've seen the most common sign of this: The inability to delegate. This one simple element is probably the biggest roadblock to success for small business owners. Inability to delegate boils down to lack of trust. You either don't trust the people personally, you don't trust their technical ability, or you don't trust their commitment to your success. In my personal experience, I failed to grow my business beyond a certain point for about five years because I didn't trust that anyone could do it as well as me. Part of this had to do with technical ability and part of it had to do with client relationships. Eventually I decided that I was looking at the problem wrong. I divided my fears and conquered them. On the technical side I realized that I could hire someone to do some of the work and not all of the work. I didn't need every technician to be a superstar. I could find good techs and grow them into great techs. On the client relationship side I decided that I can't turn over that job very easily or very quickly. So I kept the client relationship job and handed off technical work. Eventually, I was able to find just the right people who could be trusted to tend to the client relationships. Only then did I turn over that piece of the business. Trust is difficult to transfer. It may actually be impossible to transfer. You can help someone grow trust and build trust with a client. But the client will always judge that person based on their ability to follow through and fulfill the promises made. Next time we'll talk more about trust maintenance and transferring trust. This year’s pre-day event will be a four-hour Jam-Packed event. 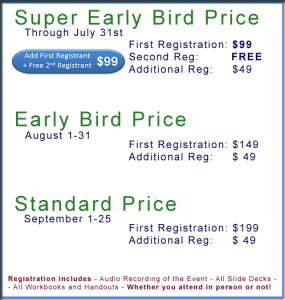 Super Early Bird Registration: First Two attendees only $99 !!! Is This Really a Mobile-First Cloud-First World?